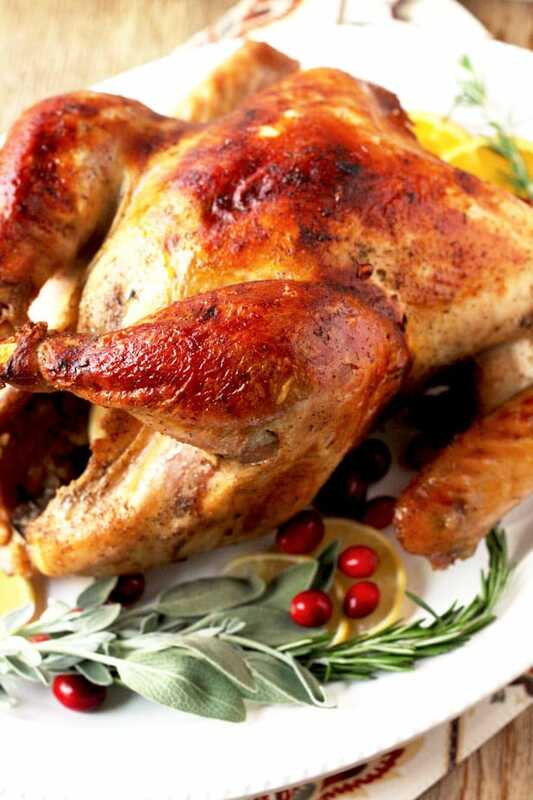 You are here: Home / Chicken and Poultry / Brined and Roasted Turkey ~ Perfect Every Time! 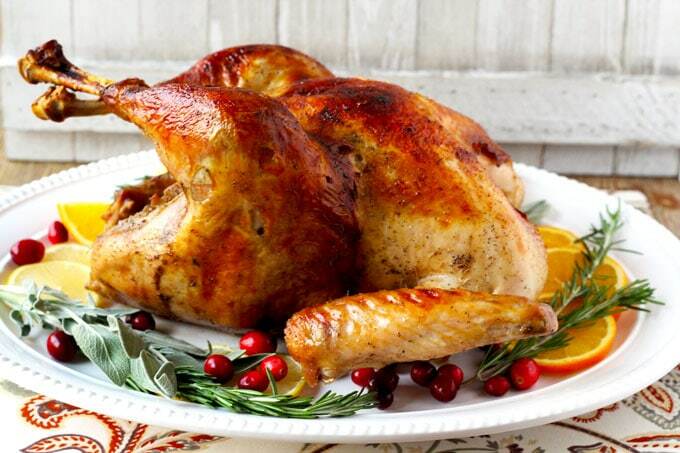 Brined and Roasted Turkey ~ Perfect Every Time! This Brined and Roasted Turkey is the answer to your turkey/holiday anxiety! Perfectly juicy, tender, delicious and golden to perfection turkey every single time! Easy to find ingredients and a simple brining technique is all you need. If you can dunk a turkey in flavored water, you got this! The task of cooking a turkey for Thanksgiving is daunting. There are too many expectations and if you ever attended culinary school the expectations get even higher. But seriously, do you think professional chefs cook Thanksgiving turkeys all the time? Ah… no! For years, I stressed over the perfect turkey. Every time someone else in the family offered to cook the bird I sighed in relief! I would offer to make all the sides and do all the dishes as long as the responsibility rested with someone else. 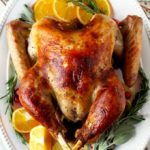 About 5 years ago, I decided to brine my turkey and my life changed forever ~ all the “thanksgiving-turkey-anxiety” flew away! 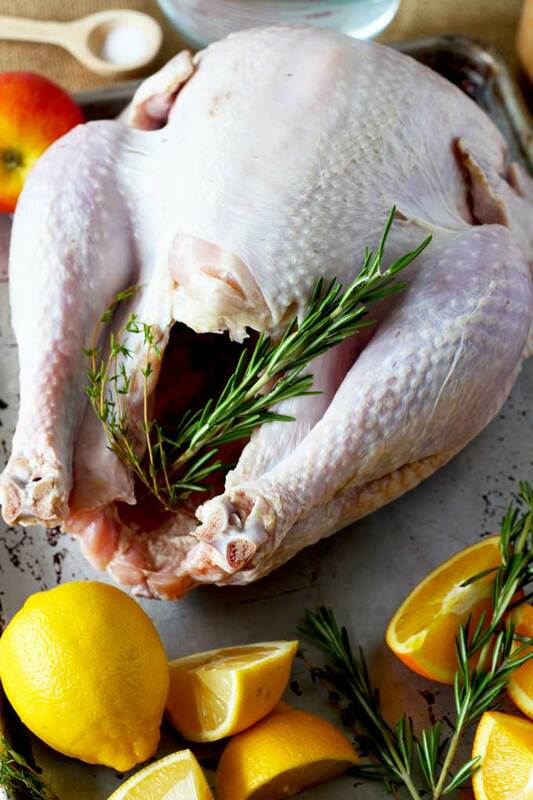 No matter how you want to season your turkey – with herbs, butter, Cajun spices, fruits or with your great great great grandma’s secret recipe; one thing that always delivers a moist turkey is a brine. Well imagine giving your turkey a beauty & relaxation bath. Brining is a way to ensure the reduction of moisture loss in lean meats. Brining enhances juiciness and flavor. The main brine ingredients are water and salt. Really, that’s all that is needed! Now if you add a few aromatics into the mix you ensure deeper and more complex flavors, in other words more deliciousness! (that’s the proper term by the way). I learned from a Chef I deeply admire to also add sugar to the brine. Does it work better than just salt and water? well ~ did I tell you the person who told me this is a very famous and well known chef I deeply admire? If Rocky Balboa tells you how to throw a punch, you will probably just follow his lead! Wouldn’t you? 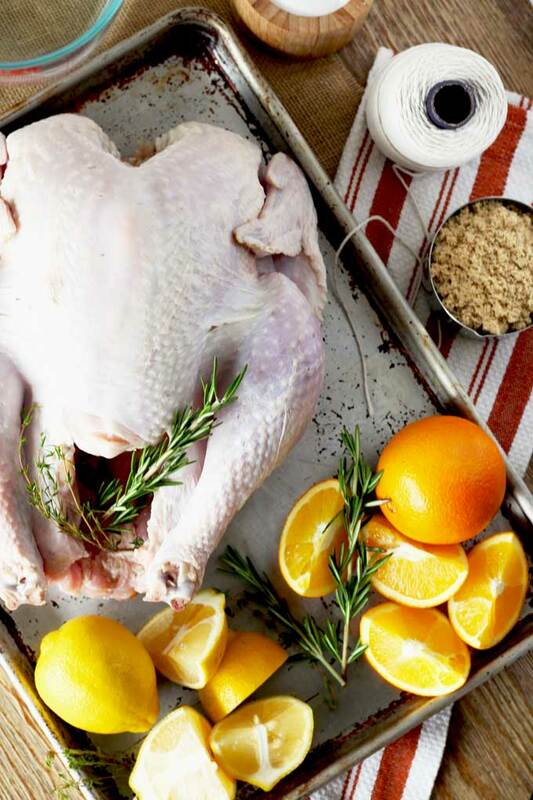 How long do you brine your turkey? I will say overnight will guarantee the best results but 4 hours works too! You will need a big container to keep your whole bird submerged at all times. Think big soup pots, plastic storage containers and buckets. No lid? No worries! You can always use aluminum foil or sticky plastic wrap. Are we ready for the Brined and Roasted Turkey recipe? 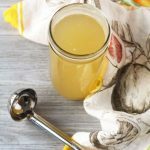 Here’s a link of my favorite Basic Chicken Stock!! My Sweet Potato Casserole with Crunchy Topping is seasoned with Bourbon Brown Butter and topped with a sweet, salty, nutty and crunchy topping. The perfect side dish for this Brined and Roasted Turkey! Every year my kids ask me to make Mac and Cheese as part of the Thanksgiving feast. This Mac and Cheese Carbonara is easy and elegant enough to serve during the holidays! 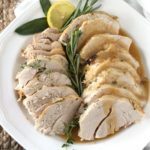 If you are having a smaller holiday gathering, or want to have turkey breast ready for sandwiches, salads, lunches, etc this Slow Cooker Turkey Breast with Gravy is juicy, delicious and easy to make – and yes! 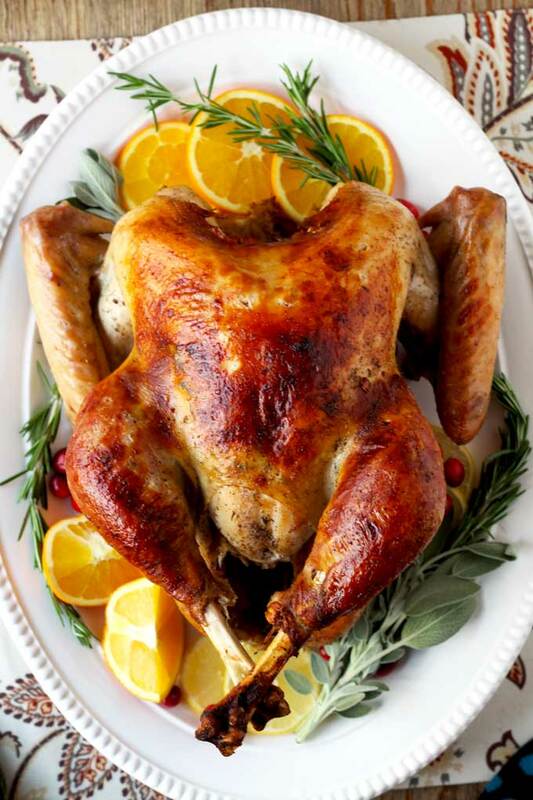 we even crisp up the skin for a picture-perfect bird! WANT TO TRY THIS BRINED AND ROASTED TURKEY? PIN IT TO YOUR DINNER OR HOLIDAY BOARD!! In a non-reactive container (like a clean bucket, big stock pot or a food grade plastic container) dissolve the salt and the sugar in 2 gallons of water. Add the rest of the brine ingredients. Remove the neck and bag of giblets from the turkey cavity. Rinse your turkey under cold running water. Submerge and soak the turkey into the brine. Cover and refrigerate for 4 hours and up to 24 hours. If you have a very large turkey and need more brining solution, use ½ cup of salt + ½ brown sugar per gallon of water. In a heavy saucepan place the turkey neck, giblets and heart. Add the chopped onion, carrots, celery and bay leaf. Pour water and broth and bring to a boil over medium-high heat. Lower the heat to medium low and simmer for about 45 minutes to 1 hour or until reduced to about 4 cups. You can add the turkey liver during the last 15 minutes of cooking. Strain the stock and reserve. NOTE: If you like to add turkey neck meat and giblets into your gravy, pull the meat from the turkey neck and chop finely. Do the same with the giblets. Reserve. Remove the turkey from the brine and rinse well under cold running water. Pat dry with paper towels both inside and out. In a small saucepan melt the butter over low heat. Add the garlic cloves and soy sauce. Mix to combine. Place the turkey breast side up in a roasting pan. Season inside the cavity lightly with salt and pepper. Stuff the turkey cavity with the onion, carrots, celery, lemon, thyme, rosemary and a few sage leaves. If you cannot fit all of it inside the cavity, it's ok to place some of the ingredients around the bird. Pour some of the melted butter mix under the turkey skin trying to get some on the breast and around the legs and thighs. You can discard the garlic cloves or make sure they end up inside the cavity or under the turkey skin. If you leave them on the baking pan, they could potentially burn Pour or brush on the rest of the melted butter mix over the turkey (trying to get it everywhere). Season very lightly with salt and pepper to taste. Loosely tie the drumsticks together with kitchen string. Roast the turkey uncovered, breast side down for 1 hour. Remove from the oven, turn and baste with turkey or chicken stock. Continue roasting breast side up for about 2 hours to 3 hours or until an instant-read thermometer registers 165 degrees Fahrenheit when inserted into the largest section of thigh meat (avoid the bone). Baste the turkey with about ½ cup of turkey or chicken stock every hour during the cooking time. Remove from the oven and place on a serving platter. Tent with aluminum foil and let the turkey rest for 15 minutes before carving. Discard any vegetables or herbs from the roasting pan and pour the turkey pan juices into a glass measuring cup. Skim off the fat. Place the roasting pan on 2 stovetop burners over medium heat. Return the turkey pan juices into the roasting pan. Add the wine. Deglaze, stirring to scrape the brown bits from the bottom of the pan. Add the 3 cups of broth and bring to a simmer. Reserve. In a saucepan, melt the butter over medium high heat. Stir in the flour and cook, stirring constantly, to make a roux. Cook for 4-5 minutes. Add the hot stock from the roasting pan into the saucepan whisking constantly. Lower the heat to medium-low and simmer until thickened stirring as needed. At this point, you can add the reserved neck meat and giblets, if desired. Adjust seasoning and pour into a gravy boat. Previous Post: « Pomegranate Margarita ~ The Best Margarita Ever! This recipe turned out even better than it looks in your photos! 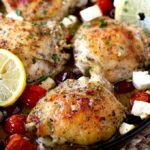 It was so juicy and the skin perfectly browned… Definitely going to make this again! This turkey looks amazing. This is what we will be eating on thanksgiving this year. Brining sounds like the perfect solution to my dried up turkeys. I am excited to try this. Lots of details in your post. Thanks! We made this turkey recipe for our Thanksgiving dinner. It was the BEST turkey we’ve ever had. The only recipe we’ll use from now on. It was moist and perfectly seasoned. Everyone loved it! Thank you so much! Thank you for sharing! I am so happy to hear that! We love brining our turkey! It makes such a difference!